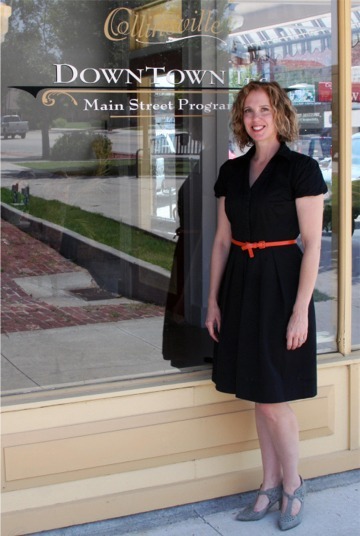 Collinsville, Oklahoma, August 1, 2014- The Collinsville Downtown, Inc. Board of Directors is pleased to announce the selection of former Executive Assistant at the Chamber of Commerce, Shelley Nachtigall and the new Main Street Program Manager. Nachtigall formally accepted the position and began work on Friday, August 1. Nachtigall grew up in Collinsville before earning a Bachelor of Artss degree from the University of Tulsa. After twenty-one years in non-profit management, public relations and fundraising experience, Shelley recently moved back home to Collinsville to focus on raising her family. She has worked as the Executive Assistant with the Collinsville Chamber of Commerce for the last year and a half. Collinsville Downtown, Inc. is a volunteer-based organization designed to help our community search for effective and affordable solutions to historic preservation and economic revitalization of the downtown business district. The mission of the Collinsville Main Street Program states that it is to be instrumental in directing the restoration of historical Collinsville to it's original nostalgic appearance, business fervor, public attraction, and profitability to fit the needs of our contemporary community. Upcoming events for Collinsville Downtown, Inc. include the popular Taste of Collinsville, which will take place on September 18, 2014, the Back Alley BBQ contest is slated to take place in October, as well as, the Just Treats  No Tricks Halloween Event, the annual Live at the Crown vocal contest will take place in December, and they are hard a work planning to unveil another exciting event to also take place in late fall. Stay tuned for details on that. The Collinsville Chamber of Commerce is now actively looking for a replacement for the staff position now left vacant with the move of Ms. Nachtigall to Main Street. Anyone wishing to submit a resume can email it to tbrown@americanbankok.com. For more information about Collinsville Downtown, Inc. visit their website http://collinsvilledowntowninc.com. You can also follow Collinsville Downtown, Inc. on Facebook and Twitter.